Entrepreneurs and intrapreneurs are both visionary in nature. With extensive skills and knowledge, they have a high chance of gaining leverage in their companies. However, although entrepreneurship and intrapreneurship tend to be used interchangeably, they have notable differences. Entrepreneurs are people who invest time, effort and money to start a business and keep it running. When a business idea fails, they take full responsibility. In addition, entrepreneurs are in charge of outsourcing finances to keep their business thriving. Since they face the highest risks, they are not just involved with the business; they are fully committed to it. Intrapreneurs are also liable for the success or the failure of a business. They are hired by an organization to initiate ideas and recognize areas of growth within the business. Just like entrepreneurs, they use their skills, ideas and knowledge to gain business leverage. 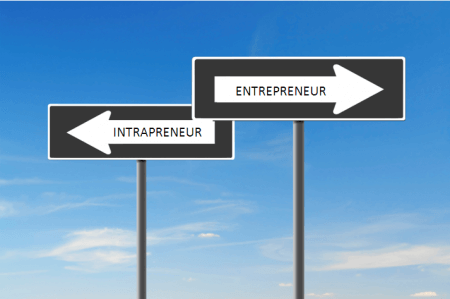 So what’s the difference between an entrepreneur and an intrapreneur? Intrapreneurs are employed entrepreneurs. They assume entrepreneurial roles in organizations but are also bound by the limitations set by the organization. For instance, an intrapreneur who is about to implement a new idea needs to obtain approval from the organization first. Entrepreneurs, on the other hand, enjoy unfettered freedom and control over the company. In terms of profitability, entrepreneurs can either be at the winning or losing end of the rope. If the company succeeds, they can expect a quick return of investment. If marketing strategies fail, however, entrepreneurs are still responsible for meeting their company’s financial needs and obligations. Intrapreneurs can expect paychecks regardless of the financial situation of the company. The video below is a brief podcast by motivational coach and business speaker Federico Re. He gives us a sneak preview of the life of an entrepreneur and an intrapreneur.